Let us talk about relations of our four-footed friends with their fellows. As far as Dobermans are concerned these canines are quite friendly and prefer making friends with other animals or other dogs in particular rather than to fight with them. Due to inborn nobility Doberman does not come to blows first only if provoked to fury by battlesome dogs he can adequately respond to the offence. Actually, Doberman behaves to small, medium or large dog in like manner. A certain Doberman is known to have lived together with a couple of cats in one flat without quarrelling with them! In fact, these animals are intelligent and can properly behave when being in public places or among other dogs. Even if another dog starts barking at Doberman he will not be angry with this pooch. Doberman will deal honorably in this case – he will pretend not hear this barker. It is false statement that Dobermans are aggressive and wicked dogs. As a matter of fact, these canines have gained such reputation because they were used for protection and owing to their power and size. They may attack somebody if it is a danger to life of their owners or in order to protect their property. It is hard to find more amicable pets than Dobermans. Moreover, human kids adore Dobermans and are happy to live with them together. Does your Doberman get along with other dogs? Dobermans are popular with pet handlers nowadays. Portrait of Doberman is as follows: a short-woolled dog with perfect silhouette and smooth gait, charisma and alive glance, good manners and quick wits.. It is a pleasure to deal with Doberman or just look at him no matter if he plays, walks or just sleeps. These wonder living beings are famous for inborn bravery, fantastic abilities to investigate, spacious mind, great strength, acute power of scent, necessary characteristics of working dog. Doberman is on the list of intellectually ranking among other canine individuals. 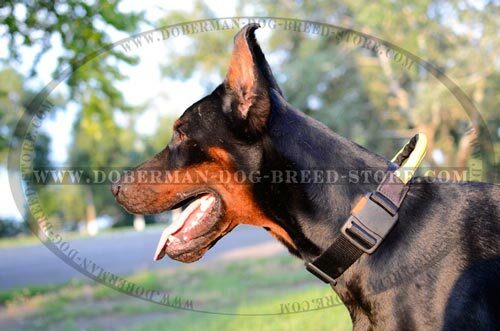 Be in haste to get Handcrafted High Quality Canine Equipment for your Doberman. Exclusive manufacturers of first-rate dog goods want you to pay your attention to demandable pet supplies. 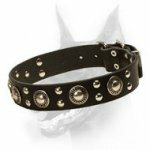 Classic and fashionable canine equipment is presented on popular store for Dobermans! Our makers are true dog fanciers therefore they are successful in creation of best canine products. Each article of theirs is invented with care and responsibility. 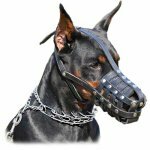 So, welcome to reputed shop for Dobermans! Every product to be on sale here features great serviceability, functionality, dependability and usability. 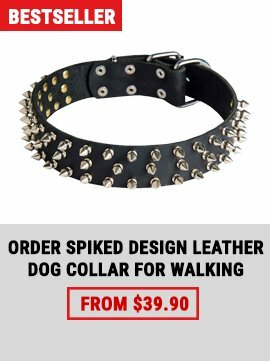 Choose out of unique handcrafted leashes, collars, harnesses, bite sleeves and tugs, toys. Gladden your Doberman with sophisticated accessory. To protect your Doberman during attack training is rather easy if equipping him with special gear. 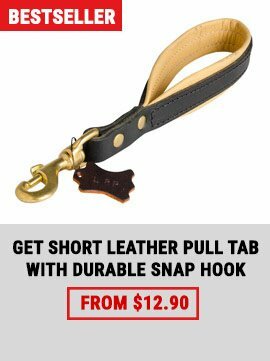 Manually made fully leather protection harness is offered to you, dear Doberman owner! Wide breast plate as well as back pad is lined with heavy felt to absorb the shock of blows caused through the combative occupation - attack work. 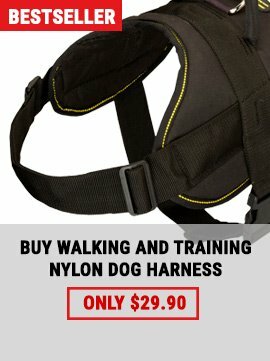 Due to well-thought design the harness fits the dog properly. At that all the pressure is evenly distributed across the body. Continuous comfort is provided by this harness. 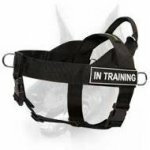 Best training harness is a finding for every dog handler! Want your dog go next to you without making much effort? Send him harmless ultra sound signal with New Super Effective E-Device and he will stop pulling on the leash! This is a patient trainer that knows how to deal different canines. The device is too sensitive and responds to even insignificant pulling. On hearing the signal the dog becomes disinterested in pulling on the leash. The sound speaks directly to the emotions – it is like a magical music for the ear the same adorable as mother voice. 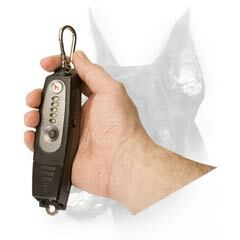 Gradually leash pulling will be eliminated and you will manage to easily communicate with your pet.